Hibernian manager Pat Fenlon has made his first signing of the summer, landing defender Tim Clancy on a two-year contract. The 28-year-old arrives at Easter Road under freedom of contract, having been at Motherwell last season. Clancy can play across the back four but Fenlon sees his fellow Irishman at right-back. "His versatility will be a major plus for us and so will his attitude and application," said the manager. 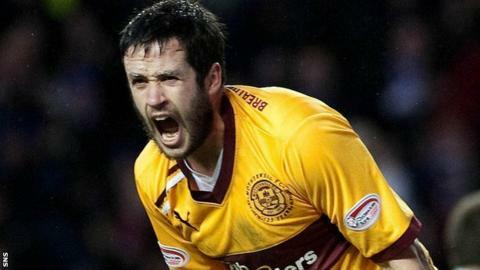 Clancy, who moved to Fir Park from Kilmarnock last summer, rejected the offer a new deal at Motherwell after helping the Lanarkshire club finish third in the Scottish Premier League. "It was a tough decision in some respects," Clancy told the Hibs website. "Last season at Motherwell we had a very tight squad; we didn't use many players, which I think helped us. "All the players knew each other's game and we were lucky with injuries as well. It was very enjoyable because we won our fair share of games and finished with the highest ever number of points that Motherwell have had in their SPL history. "So qualifying for the Champions League qualifiers was a pull to stay, but as soon as it was nailed on to come here to Hibs I was delighted to sign. "Hibs are a big club in Scotland and I jumped at the opportunity." Born in Trim, County Meath, Clancy began his professional career at Millwall in 2003 and moved to Kilmarnock four years later. He spent most of his time at Motherwell playing in central defence but also provided cover in both full-back positions. "Tim fits the bill - he is exactly the type of player and character that we've been looking for," added Fenlon. "He had a fantastic season for Motherwell and he will be a sound addition to the squad, so we're pleased to announce his arrival - the first one of what promises to be a busy summer transfer window."